Sometimes we may need to chat with friends for just few minutes, think you don’t have that Instant Messenger (IM) what you are going to do? 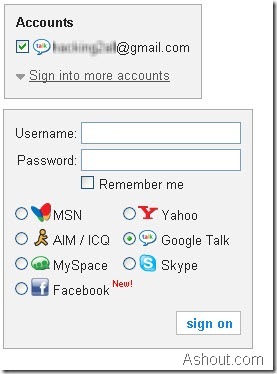 Are you ready to download that Instant messenger software? In such position it is better to have web-based Web Instant Messenger or we can also call it has Online Instant Messenger. 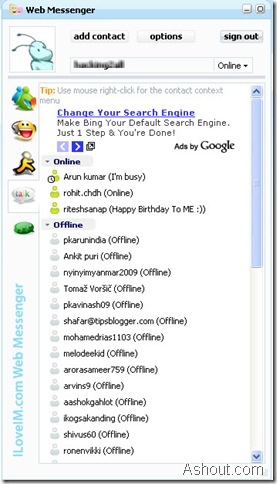 So today I’m going to share some most popular Web Instant Messengers, some of these web instant messenger having even multiple IM messenger option. What is Web Instant Messengers and Why should I use it? 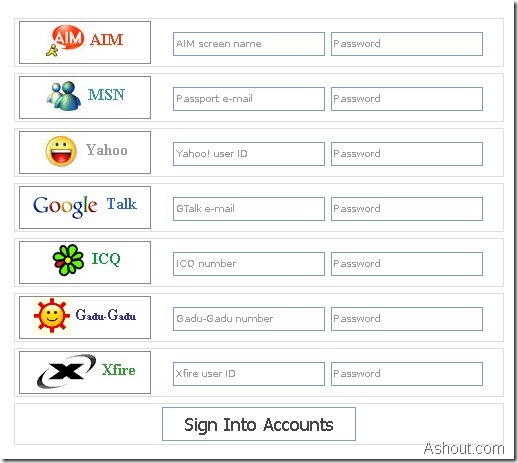 Web Instant Messenger is same as Instant messenger software, but in web instant messengers we don’t need to download any IM software to start using it. 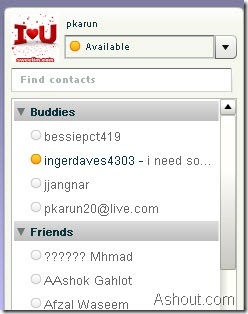 We can use online website to chat with other friends which are already added in our IM list. If you thinking about why I need to use online IM, then the answer for that question is- Your Pc won’t use memory if we start using online IM because you don’t need to install any software on your pc. Installing many software slowdowns our pc. But online Web Instant Messenger is not for those who chat daily. This Web Instant Messenger helps only for occasional IM users. 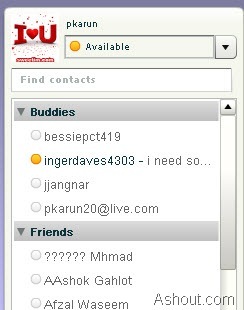 So today I’m going to least some of the most popular Web Instant Messenger available today for free. Meebo is one of the popular online IM which supports most of all popular IM in one place. 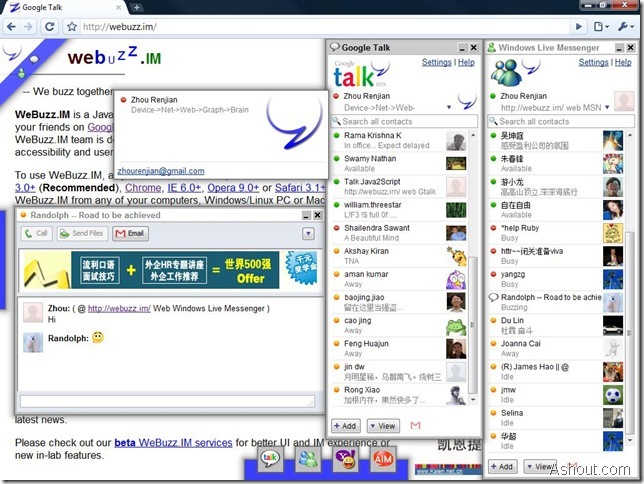 You can use Meebo for chatting with Yahoo IM users, Gtalk users, Windows live users and facebook users (alpha stage) and many more. If you want to stay connect with all different IM, then you may need to try Meebo. 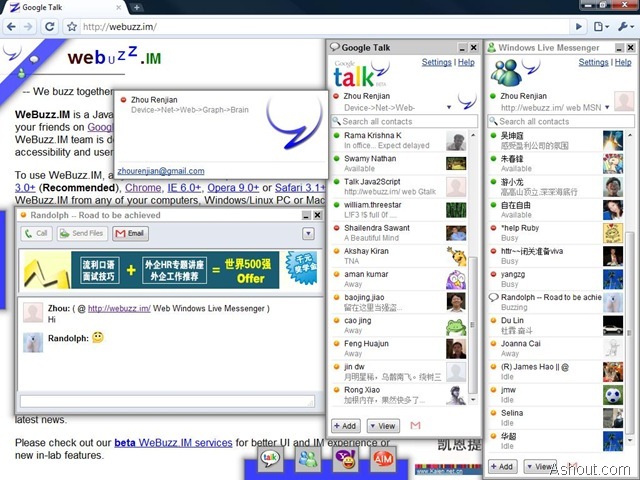 It also supports multiple gtalk account in one place. 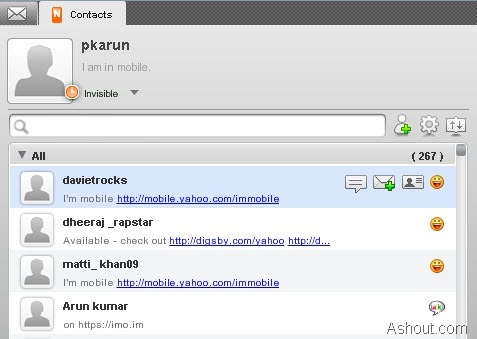 ILoveIM.com is Web-based Instant Messenger service lets you stay connected with MSN, Yahoo, AIM, Gtalk and MySpace messengers. There is no need to download and install anything into your computer to use web messenger. All you need is a web browser with Internet connection! 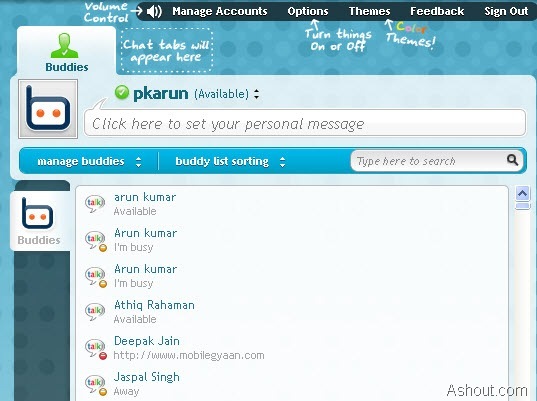 eBuddy is also one of the online messenger for using MSN, Yahoo, Gtalk, Facebook, ICQ, MySpace and AIM (AOL). It works same as other web instant messenger, but if you choose ebuddy you can get some more benefit is, we can use ebuddy on mobile too. It is one most famous mobile chat messenger. 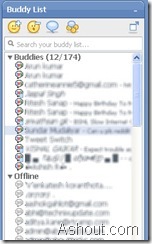 It supports Multiple Instant messenger in one place as other web-based instant messenger. In imo.im you don’t need to register their service, you can directly sign in with the IM username and password. 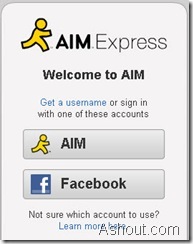 If you are an AIM user, then you can use their IM service without downloading any software.To use web-based AIM just visit aim.com and choose Launch AIM option. 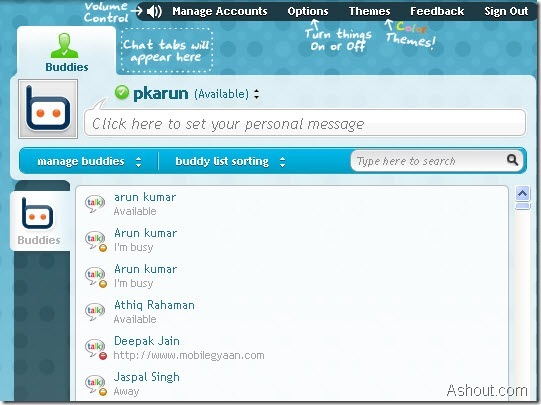 Nimbuzz is also one of the best web chat messenger and also mobile chat messenger. KoolIM.com is a web messenger application that allows you to stay connected with your favorite Instant Messenger almost anywhere. You need a computer with just a browser only. There is no need to download and install any software or Java plug-ins into your computer to use KoolIM.com Web Instant Messenger. KoolIM.com provides friendly, light and very easy to use web-based interface with almost all core features from the original Instant Messenger. To use WeBuzz.IM, all you need is a modern browser, like Firefox 3.0+ (Recommended), Google Chrome 3.0+ (Recommended), IE 6.0+, Opera 9.0+ or Safari 3.1+. You can use WeBuzz.IM anywhere, Windows/Linux PC, Mac, home or office behind firewall. 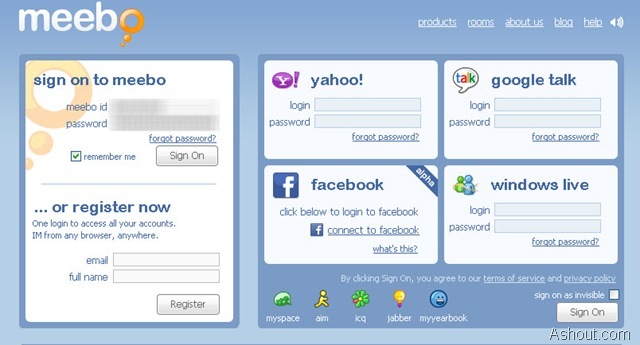 Official online web messenger for yahoo messenger. In yahoo web messenger, you are able to chat with only yahoo users and MSN users. 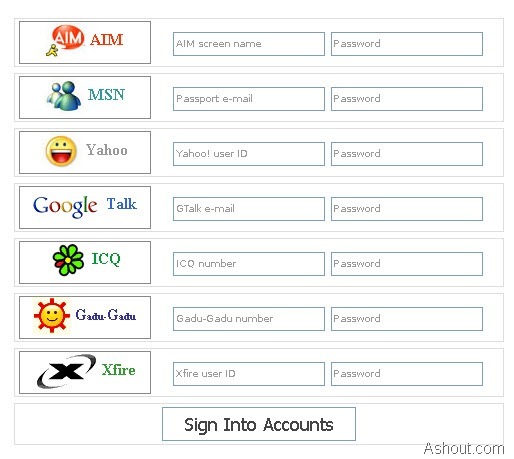 There are more number of free web instant messengers are available online, but I selected only few of them which seems good for me. If I left any good site, you can share with us by posting comment. Great listing mate. I have used meboo and I am still satisfied with them. Nice list! 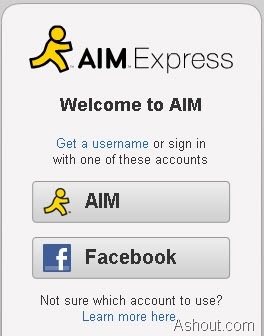 I use aim all the time, but it’s got some features that have been slowing me down lately. I’ll have to check out the ones in this list. It’s funny, that sometimes the simplest tips are often the best! I will take these tips on board and see how I go. Thanks for this post! 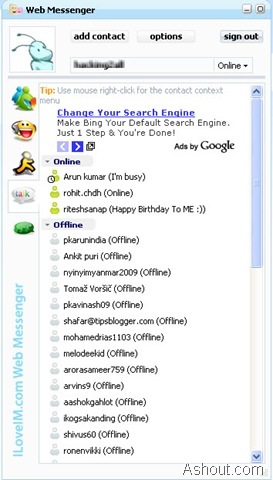 Does anyone know if any of these online/web IM’s offer you the opportunity to save a chat history. I want a record of my online chat history, and Gtalk does not offer it. I can’t even cut & paste it. entire world, following starting it generally in the U.S.
call for a connect-in installation).